My father passed away from lung cancer five years ago this month. I was privileged to be one of his caretakers in the last months of his life, along with my mother. One of the things we did to pass time was look through old photographs. It was during one of these reminiscing sessions that he looked at a photo and said, “Now, this is the love of my life.” Feeling that he was about to share something very special about my mother, I reached for the photo. It was of his beloved Labrador retriever, Cammie. My mother and I and Cammie were all with him when he died. The bond of an aging senior and his pet is sacred. 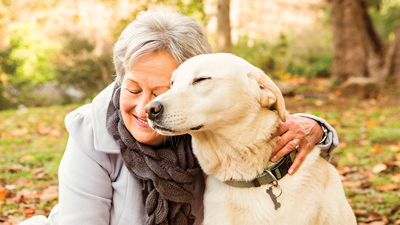 How can we try to ensure success when loved ones are headed to a retirement community or assisted living with their dogs? Think four on the floor. One behavior owners will want to manage is jumping. 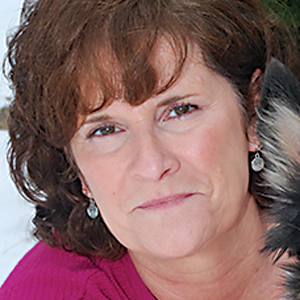 Many seniors have thin skin and a jumping dog can do a great deal of damage. Teaching a dog proper etiquette when at doorways and greeting guests is key to eliminating this problem. A calm dog should always get the attention, not a wild, out-of-control dog. Give affection only when the dog has calmed himself and is seated like Pet Stopa gentleman. A retractable leash can cause a multitude of injuries. These include burns, cuts, bruises, and in severe cases, amputations from the cord wrapping around someone’s fingers. Legs are not out of danger either. An old-fashioned sturdy nylon leash is hard to beat. It should be substantial, not skinny and wimpy. Nobody likes a serial barker. Have you ever known a dog that barks at everything, even a leaf rustling on a tree? He will not be welcome in most places. Practice a command with the dog so that he understands when to stop barking. The biggest issue with stopping this behavior is consistency. As owners, we become bark-deaf, much like a car alarm that people no longer react to. There are also tools on the market to help pet owners. The citronella collar gently sprays citronella at the dog when he barks. Place any collar like this on the dog for several days before turning it on. He should think that the behavior causes the spray, not the collar. There are also ultrasonic and pulse collars. Steer away from shock collars. Litter isn’t just for cats. A dog can be litter box trained. There are also many options with pads that look like grass and are machine washable. If the dog has always had access to a yard, but will now need to take care of business while being walked on a leash, don’t assume he will do this. Some dogs are modest and want the yard. Put him on a leash, take him out, use a command like Go potty, and remain quiet. Don’t be more interesting than going potty. New is new – not scary. If the dog will be around walkers, wheelchairs, oxygen, and the like at the new residence, experience these things with him and make them positive and good. Don’t coddle. Be matter of fact. Moving into a new situation is scary for anyone. Prepare your dog, and he will remain a cherished companion. Next articleMarch is here, which means – hooray!